Mustapha praised President Muhammadu Buhari for adequately addressing security challenges confronting some parts of the country by taking the needed steps. The Federal Government has acquired 23 war planes, in the battle against insurgency in the North-East and, to curtail security challenges in the country. Secretary to the Government of the Federation (SGF), Boss Mustapha, disclosed this to newsmen, on the sidelines of the Independence Day parade at the Eagle Square, in Abuja, yesterday. Mustapha, who spoke soon after the grand finale of events commemorating Nigeria’s 58 birthday celebration, said the country has every reason to celebrate. He praised President Muhammadu Buhari for adequately addressing security challenges confronting some parts of the country by taking the needed steps. “We have to be reflective with this particular situation. “The last time we had such a celebration was in 2010, which was our centenary celebration. So, for the last eight years, we have not had any major celebration, and we felt strongly that we are loosing trend with our tradition and our history. “A child born seven years ago has no idea whether we celebrate our national day or not. “So, I want us to look at this particular incidence, today (yesterday), with retrospect and appreciate the fact that we have come a long way and God has been faithful to us as a nation. “Most of the equipment our military boasts of, today, especially those displayed during today’s (yesterday) celebration, were acquired during this tenure of President Muhammadu Buhari. “As you heard from the Air force commentator that about 23 war planes have so far been acquired, so it means that in the last couple of decades, we have not paid much attention to the acquisition of military hardware; to be able to effectively fight insurgency and other forms of security challenges that we have had in the country. “Now that we are acquiring more, you can see that there is relative calm in the North-East. “Even the banditry in the North-Central and northwestern areas is being checked effectively, and, I believe it will be a continuous thing because the problem keeps propping up but as that happens, we will deal with them,” he assured Nigerians. Meanwhile, the Presidency has said after seven years of low key celebration due to the unfortunate incident of the 2010 bomb blast at the Eagles, it is happy that the 2018 Independence Day celebration was a success. Senior Special Assistant on Media and Publicity, Garba Shehu, in a statement, attributed the colourful celebration to the fact that terrorists sect, Boko Haram have been significantly degraded by the Muhammadu Buhari administration. 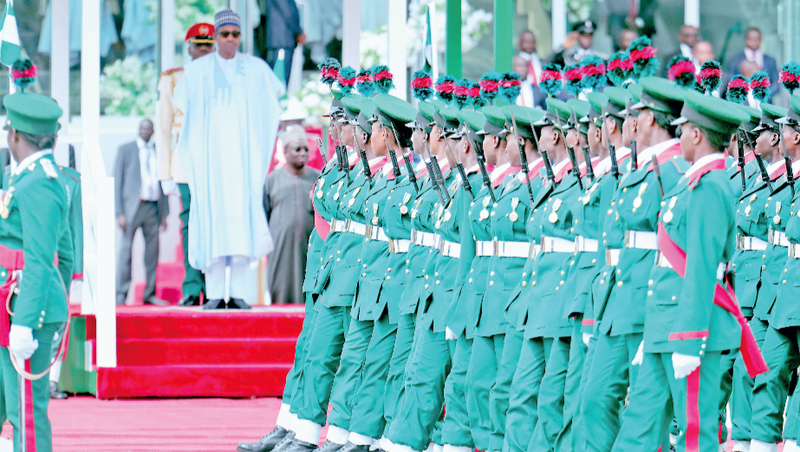 On his part, the Defence Minister, Brigadier General Mansur Dan-Ali, said the display of hardware by the country’s Armed Forces showed the world that the military are capable of defending the territorial integrity of Nigeria at all times. The event featured displays by policemen, men of the Nigerian Army, Nigerian Navy and Nigerian Air Force (NAF). 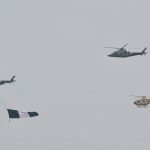 Highlight of the displays included the aerial display by men of the NAF. 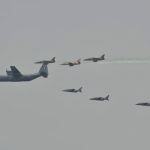 In a daring and fearless move, well-trained fighter pilots of the NAF mounted 23 aircraft and participated actively at the 58th Independence Day Celebration in Abuja, despite losing one of their colleague in rehearsal air crash few days ago. 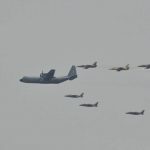 The 23 aircraft that participated in the aerial show included helicopters, fighter jets, C-130, heavy airlift, medium and light airlift aircraft. Meanwhile, Senate President, Bukola Saraki and Speaker of the House of Representatives, Yakubu Dogara, were conspicuously absent at the parade. The strictly military event was attended by president Buhari, his deputy, Yemi Osinbajo, two former military heads of state; Generals Yakubu Gowon and Abdulsalami Abubakar and other prominent personalities. Saraki and Dogara recently defected from the ruling All Progressives Congress to the opposition People’s Democratic Party (PDP). Saraki and Dogara, as number three and four citizens, respectively, are usually expected to attend national events. Former President Olusegun Obasanjo, a general, was also absent at the parade. In attendance at the parade, however, was the Chief Justice of Nigeria, Justice Walter Onnoghen. On arrival at the venue, Buhari first took the national salute before he inspected the parade in a motorcade. He later returned to the VIP stand to join Osinbajo, Onnoghen, Gowon, Abdulsalami and other dignitaries.